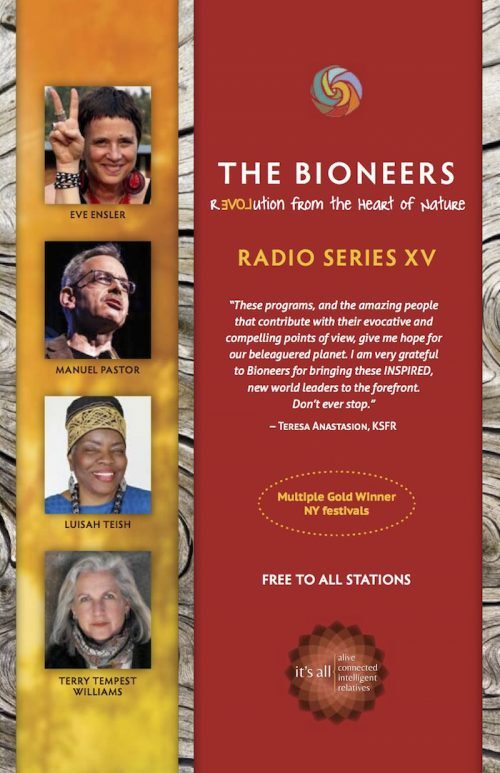 We’re happy to share with you that our 2015 annual radio series, “The Bioneers: Revolution From the Heart of Nature,” has won awards for eight shows in the international Communicators Awards contest. There were over 6,000 entries. Two shows won gold (Award of Excellence), and six shows won silver (Award of Distinction), out of 12 submitted. A pretty good batting average! I want to honor and thank my teammates Neil Harvey and Stephanie Welch who co-create the series with me – and of course all the amazing bioneers speakers who are at the heart of the shows. What is especially gratifying is that the two gold winners are truly important shows you just would not otherwise hear on the airwaves. “Just Say No: Planet Hackers, Resistance Movements and Climate Justice,” which features Naomi Klein and Clayton Thomas Mueller, is a clear-eyed critique of the capitalist roots of the climate crisis, and an uplifting look inside the growing climate justice movement and global Indigenous uprisings. The other gold winner, “Youth Solutionaries: Future Present,” featuring Xiuhtezcatl Martinez, hip-hop artist and Youth Director of Earth Guardians, De’Anthony Jones, former President of the Environmental Students Organization at Sacramento State, and Chloe Maxmin, co-founder of Divest Harvard, is a deeply inspiring window into the rising youth climate movement. It is so rare and SO important to have our youth’s voices heard! Getting the voices of the Bioneers out there widely is more important than ever, and honestly, where else you hear these visionary voices? We are so deeply grateful to all of you who support the series and support Bioneers at large to produce it. The radio series is still our biggest outreach tool, and we’re now poised to get it heard much more widely, with your support. As you may know, we had the great good fortune to hire Brooke Shelby Biggs earlier this year as our Communications Director. Brooke has a perfectly fitted track record of media-savvy skill, and she’s a true bioneer at heart. We want to get the series on many more stations and into some important and large markets. With the explosion of podcasting now, we’re poised to go after wide digital distribution through numerous strategic digital platforms and channels. We really hope you take a moment to listen to a few of the half-hour shows. You’ll see why they win so many awards every year, but what’s really important is spreading the word. Thank you for joining with us to make it happen. We can help you spread the series! If you want a flash drive, or a CD set that you can give to allies and other important folks, let us know. By the way, we’re in the thick of producing the 2016 series that will go live July 6th, and it’s breathtaking. And wish us luck in the imminent New York Festivals competition that’s even more competitive – the “Oscars” of radio! We’ll keep you posted. The continued success of our radio series would not be possible without the committed support of our incredible 2015 radio series sponsors, Organic Valley and Mary’s Gone Crackers, and all of you – thank you! Use the links below to listen to the award-winning episodes, and be sure to share your favorites with your community. Game-Changing Climate Leadership: What Happens In California Doesn’t Stay in California | Tom Hayden, Vien Truong & Wade Crowfoot – this episode is also a finalist for a New York Festivals International Radio Awards medal! Like what you hear? Subscribe to our podcast on iTunes, SoundCloud or Stitcher to get the latest episodes directly. Be sure to sign up before July, when the 2016 Radio Series will be released. Not an online listener? Find a radio station where you can listen or encourage your local radio station to air the series. Please share this post with your networks and spread the word!